For those of you in the UK, how amazing is a 4-day weekend?! Although I intend to relax and unwind as much as possible, weddings will also be a theme of the next few days. Tom and I are attending a wedding in the Shire on Sunday (oh, I do love a good wedding), as well as sorting out details for our own nuptials, which are just 5.5 short months away. Sweet lord. Better get on that. How about you? Any exciting plans for the extended break? 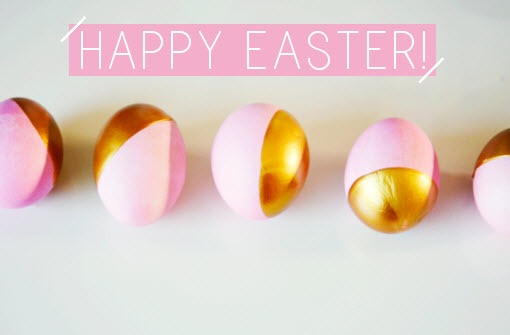 Are you as inspired as I am to paint some eggs in one of my favourite colour combos (see here) of pink and gold? Kimberly – it’s amazing… hope you have a relaxing Easter weekend!